Supreme present a little teaser of their upcoming Spring/Summer 2015 collection and lookbook. Usually, the way it works it that Supreme drop their lookbook along with product flats as a full preview of each collection before it hits their physical and online stores. This season, Supreme have changed it up a little (very little), showing one shot from the impending lookbook as a teaser. 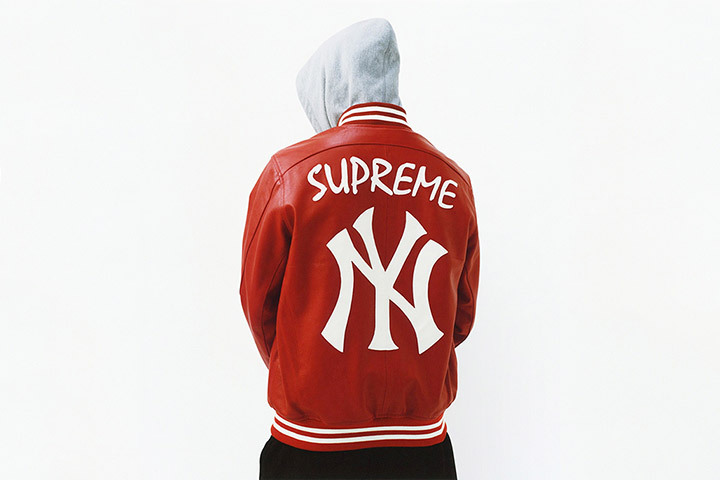 The shot shows a very nice red leather varsity jacket with the Supreme handwriting logo and the interlocked NY in white on the back, seemingly painted on (at a guess). A grey hoodie and what look like a pair of black joggers also feature, but that’s as much as Supreme are giving away right now. It’s not the most informative teaser. It doesn’t even give away much of the theme for the collection (unless it’s classic American sports), but it looks nice regardless. Hold tight for more info on the collection soon.